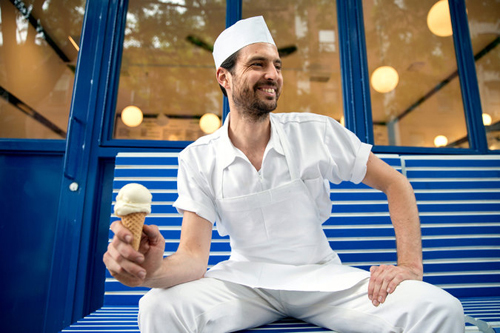 On today’s episode of THE FOOD SEEN, Nick Morgenstern blends nostalgia with innovation at Morgenstern’s Finest Ice Cream, scooping some of city’s best desserts, boasting 5 vanillas, 4 chocolates, as well as flavors like Salt & Pepper Pinenut, Raw Milk, Fernet Black Walnut, Tonka Bean, American Egg, and Durian. After a life in fine dining, it wasn’t until Nick became a business owner, that he truly understood the importance of the simple joys. Now, he operates SoCal inspired coffee bar and luncheonette El Rey in NYC’s Lower East Side, which dishes out vegetable forward fare from morning to night. There’s also GG’s, a throwback pizzeria at heart, utilizing a deck oven as the centerpiece to this neighborhood restaurant, which also has an 18 bed backyard garden to grow many seasonal ingredients. How lucky are we to have all these sweet spots from a man who almost became an auto mechanic.